LumyComp design Ltd. Designed specially for Nuclear Power Station reactor Underwater LED lamp 30W/24V – 3100 Lumen – White, Housing – massive bronze, double emitter structure, double PWR/LED Driver structure. Thermal protection and local ESD protections. The first batch of lamps are installed into the water tank of the Nuclear Power Station reactor (Kozlodui, BG, EU) by common project with company AQUABION - Varna. Here is the result of our investigation for Anti-Lightning 40W up to 10kV (- Conforming standard : EN61643-11:2002 + A11:2007) and OverVoltage (constant 380-500VAC) protection of our LED CREE Street lamps. Designed by LumyComp Design with the support of Tyco and with kindly help for measurement from TYCO laboratories in France. Company LumyComp design Ltd. will take part in Second EO-GMES Workshop 17-18 March 2011, as a member of Cluster Aero-space Technologies, Research and Applications (CASTRA). 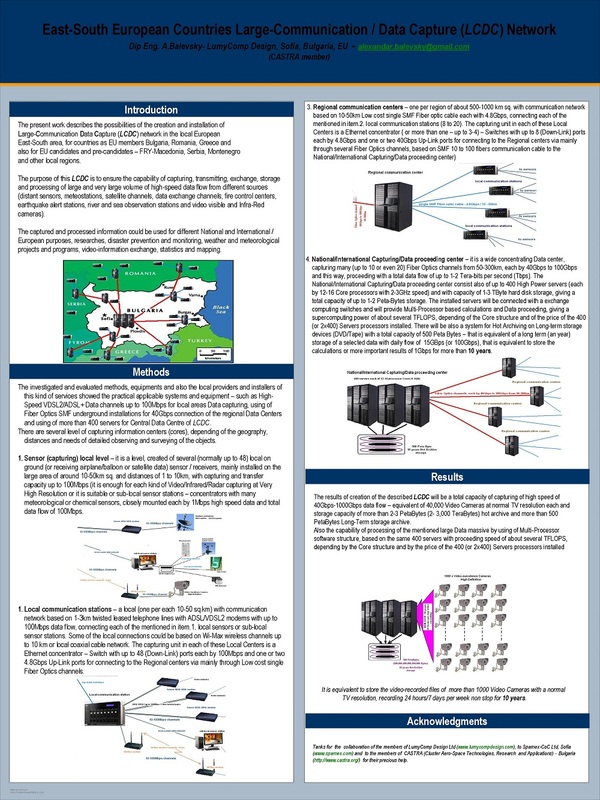 Our Company will make presentation with scientific paper (poster session): "East-South European Countries Large-Communication /Data capture (LCDC) Network". 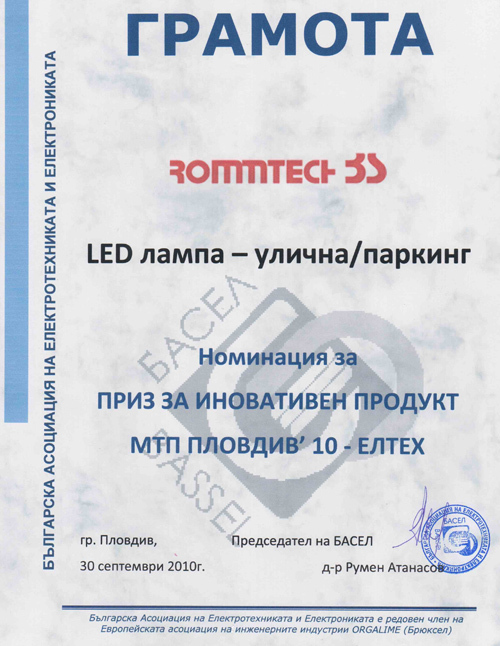 We are also glad to inform You, that we have received an award certification of the International Technical Fail -Plovdiv, Bulgaria for nomination for the LED lamp - Street / parking application for the designed new Ultra-low consumption LED lamp 24V using XM-L LEDs, designed and jointly produced together with ROMMTECH-3S, Vratza, BG. We have installed XP-G 148 Lumen 15 White LEDs using our specially designed current 24V drivers and we have reached relatively good results. See the Bulgarian document from the BASSEL- Sofia, BG (Bulgarian ASSociation for ELectrotechnics and ELectronics,full executive member of the European association ORGALIME (Brussels, Belgium). 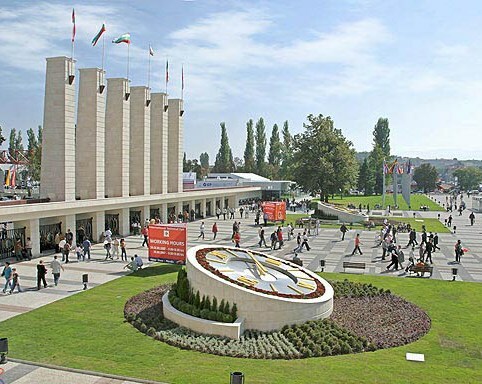 From 27 September to 2 October , Company LumyComp Design Ltd. will take part in the International Autumn Fair Plovdiv, together with our partner company Romteh 3 S " Ltd. Welcome to Hall № 8, 1st floor, booth 8I-E 3.